Have I mentioned that Thanksgiving is my favorite holiday? I love our family’s traditions - cooking and baking, a long walk, dinner with family and friends, a fire in the fireplace, and multiple desserts, including pumpkin pie, which my mom and I enjoy again for breakfast the next morning. I love that it is a national holiday, but not a religious holiday, that centers around family, food, reflection, and thankfulness. Also, no gifts. This year I’m in charge of the pecan pie. After pumpkin pie, pecan is my favorite, but I admit I don’t really like the super sugary, gooey variety. So I have modified the standard recipe that calls for corn syrup and sugar, and replaced them with a little maple syrup and dark chocolate (because everything is better with chocolate anyway). It keeps the pecan-ness of the pie, complimented by chocolate, so that those of us who can’t handle the high sugar load can enjoy it. Whisk eggs and maple syrup. Add melted butter, vanilla, and ground pecans. Sprinke chocolate chips on bottom of pie crust. 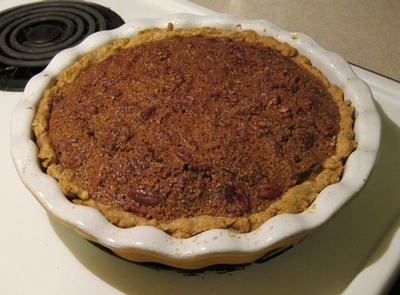 Place (whole or halved) pecans on top of chips, covering botton of crust. Pour filling on top. Bake at 350 for 40 minutes, then reduce heat to 325 and bake about 40 minutes more until filling is set.